1. Did this week seem extra long to anyone else? I am really looking forward to being able to relax this weekend. Life has been so busy. Aren't things supposed to slow down after the holidays? I guess not! 2. 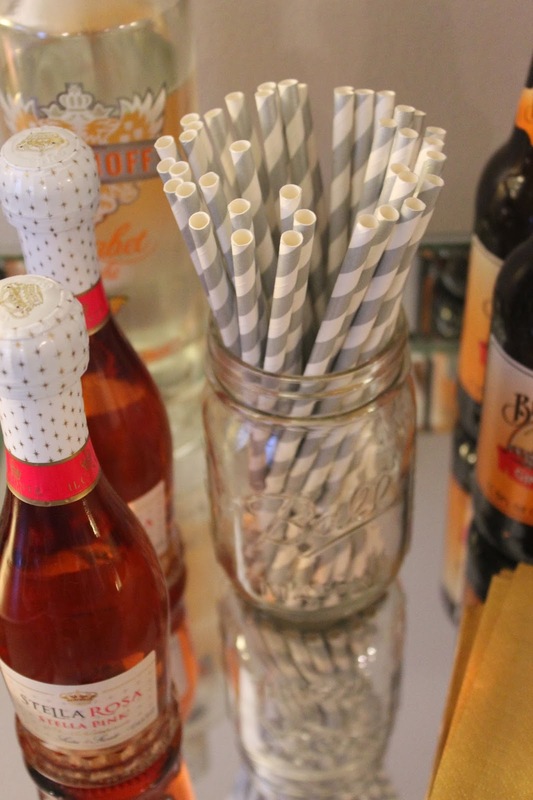 Hip hip hooray for finally sharing the pictures of our new buffet and bar area today. Let's just all pretend for a moment that we're together sharing some drinks, shall we? Speaking of drinks, we are having a few friends over tomorrow night for a craft beer tasting party. I might even make my friends wear a blindfold when tasting beers to try and see if they can tell the difference between their regular favorite beers and the craft beers. The exact details for the tastings are still being determined (and what I mean by that is tonight me and Billy have some brainstorming to do...), but it's about to be fun I know that much. We just love it. However, I'm sure it will constantly be updated and changed around...that's just how it goes with these types of things, right? The buffet is this one from World Market, and we made the top of it more of a"bar" area to display different liquors, etc. One of the first things we did after Billy put it together was paint the wall behind it gray (Silver Spoon by Behr). It was originally a dark brown color and we knew we didn't want to keep that, so we decided to paint it gray because this wall is right next to our kitchen which is painted the same color. 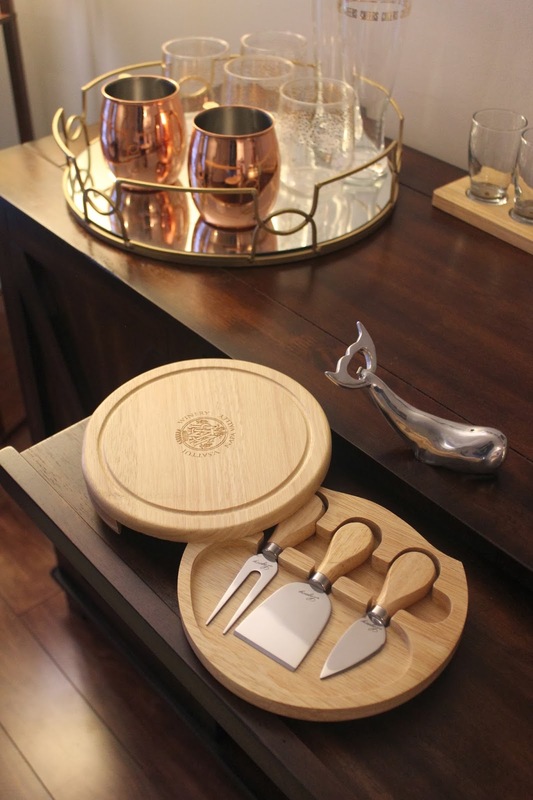 I started filling the shelves with our favorite bar items: a shaker, ice bucket with tongs, a gold serving tray, shot glasses, pitchers, a bottle opener (that is what the whale is! 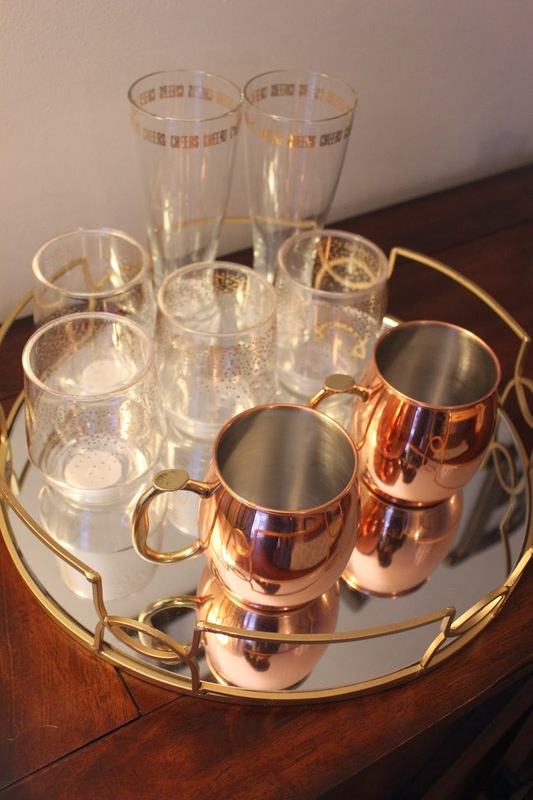 ), our favorite beer, wine, and champagne glasses, and we also decided to store our new coffeemaker on one of the bottom shelves. 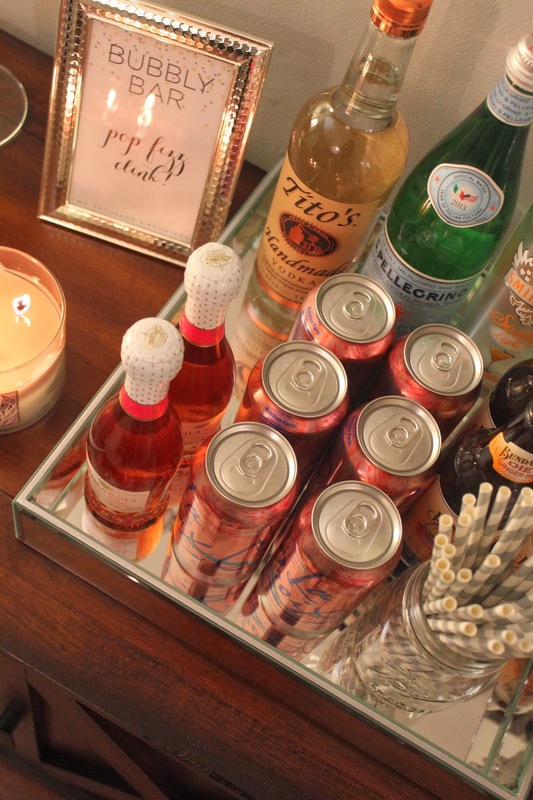 One of the best parts about this buffet is how much storage it has. We were able to move so many items from our kitchen cabinets to it, which has created much more space for us in the kitchen. My parents gifted us the "Krysh's Tavern Tasting" craft beer set and paddle, which I'm sure is about to get some use this weekend. I also decided to display some of my more favorite glasses on top. We still have some other things to get (like whiskey, gin, rum, etc. ), but since we don't drink those that often we didn't rush to get them. I think everyone needs an area like this in their house. It's just too fun. 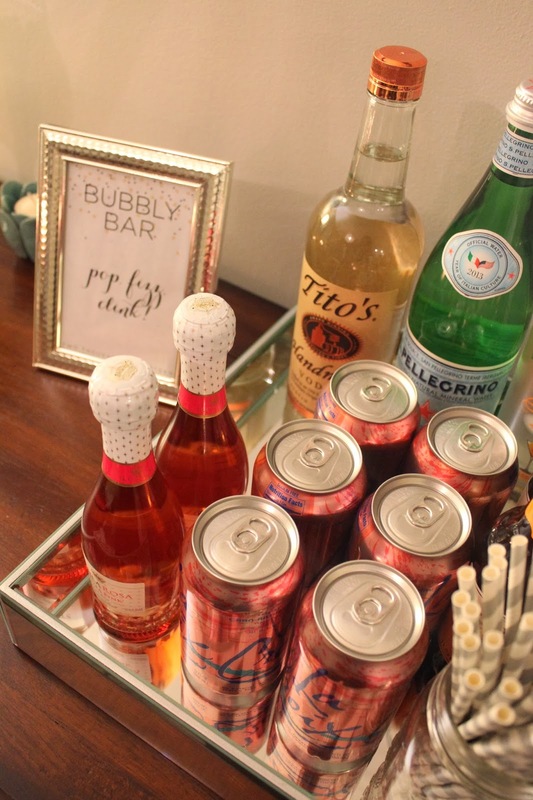 PS: If you missed it yesterday and are wanting some ideas for at home bar for yourself, here is my list of bar cart essentials! I LOVE this! I wish our house had a space that we could do this in, maybe one day... Anyway, we have gone to a friends beer tasting party and they asked everyone to bring a 6 pack of their favorite beer and a 6 pack of something that they have NEVER had! Once everyone was there they did the tasting in disposable shot glasses... it was pretty fun and I found some new beers that I really enjoyed but would never have bought before! Love the bar area! 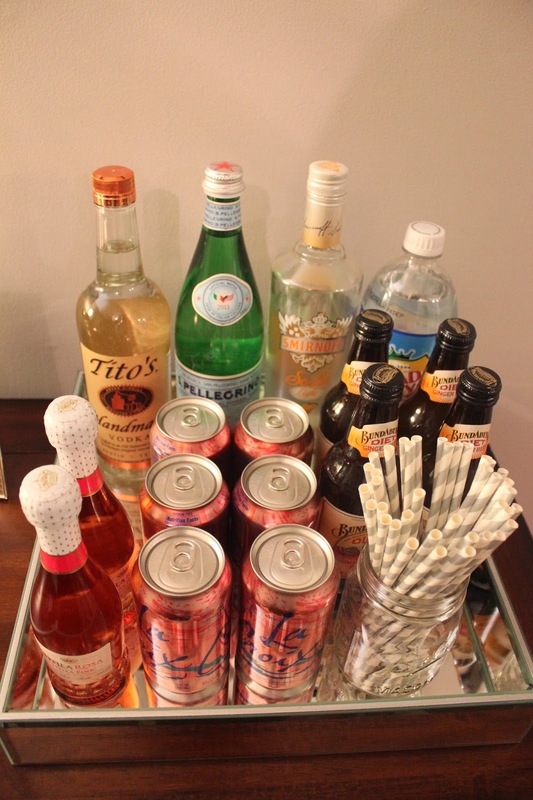 We just got a bar cart for Christmas and I have been struggling with how to style it. This definitely gave some inspiration! Super cute Katie, love how it turned out! Oh my gosh this is beautiful! When I actually move into a house larger than the 700sq ft I'm living in now that will definitely be on my list! I am cracking up Mark loves Tito's vodka I had never heard of it before but it is good! What a great buffet! I love the lettering up top and the tray ...like ...a lot. Happy weekend! It looks perfect! I can't wait to hear which craft beers you end up tasting! I absolutely love it! In fact, I'm so inspired I shoes this to Michael because I think we need an area just like this in out home! This turned out great! Love the Whale bottle opener. AWESOME, Katie! 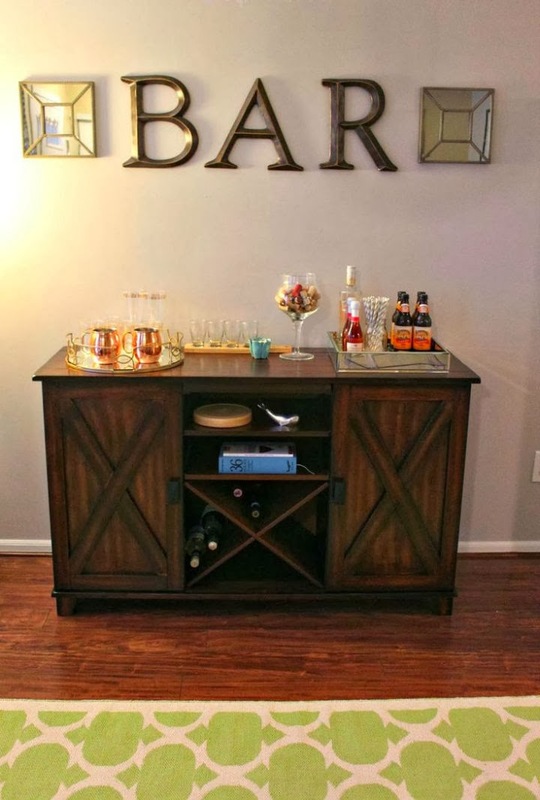 I've been thinking about creating a bar area in my own house. Thanks for the inspiration. My husband just added a tap to our bar. Too bad I'm not a beer person. This looks great BTW. WAIT WAIT WAIT I LOVE THIS! I feel like I need this in my life. 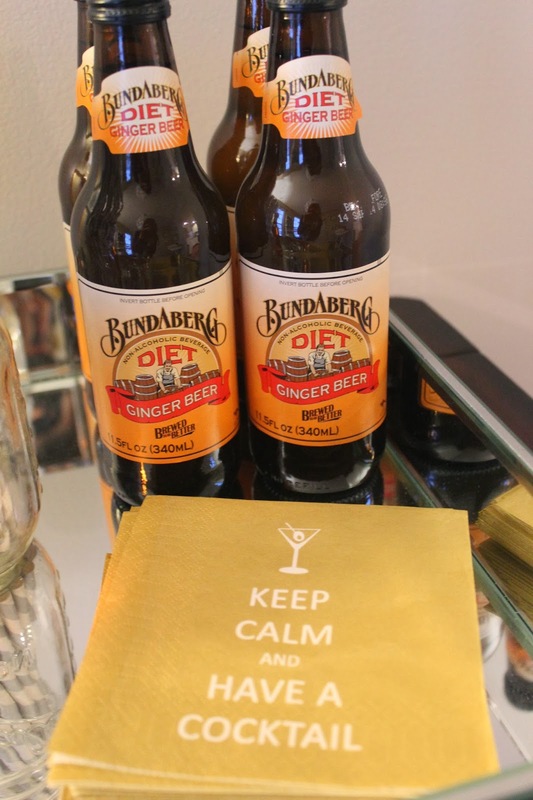 They make DIET ginger beer? Say it isnt so! Moscow mule- my favorite! I love the little taster set! Where did they get it? I know probably like half a dozen people who need something like that. You did SUCH a great job! I'm in love with this! I can't wait until we move into a bigger place and can have something like this. Although this area doesn't need ANY improvement-- I saw something the other day that caught my eye. 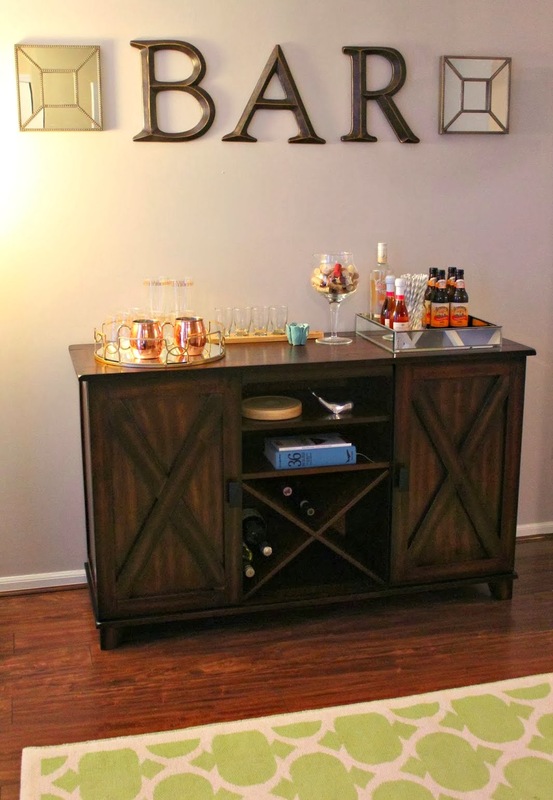 A friend of mine did something similar with a space-- while they didn't use letters to spell "Bar", they did their last name over the bar area. And they got "open" letters and filled them with wine corks. It looked really awesome. If you want to see what I'm talking about, just email me. Anyway-- like I said, this is just a great space!! 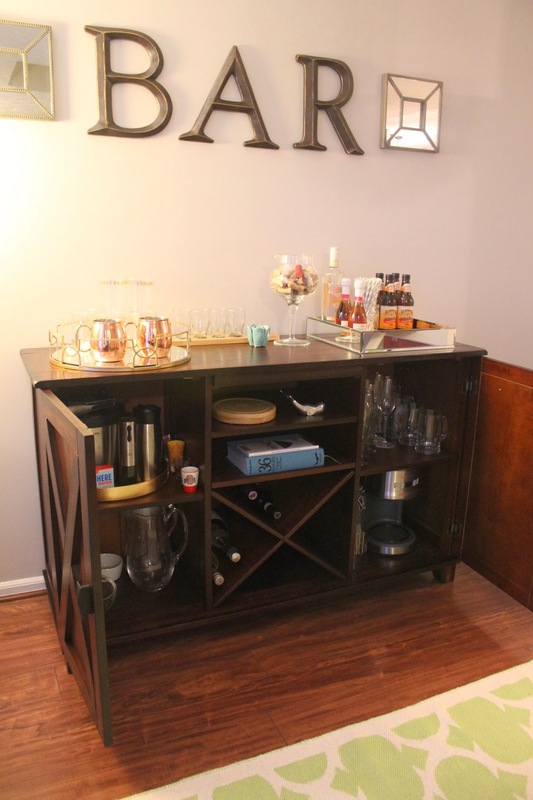 I just started putting together my bar cart area too! Love the little tavern tasting slab... Brian would be all over that. Happy weekend lady!! Oh my goodness, this is gorgeous! 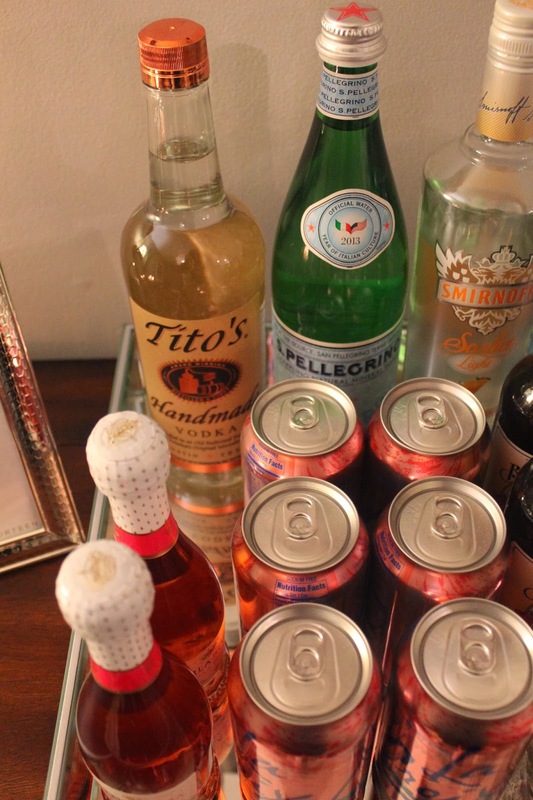 I want all of it, like right now (including the actual liquor too, of course)!!! Absolutely love this! 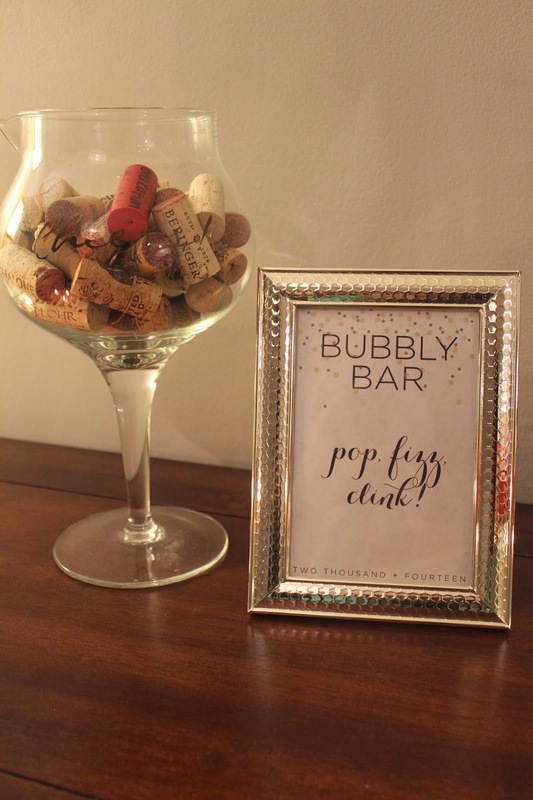 Your decor is so cute and chic! Love the new bar, and the Target tray!! 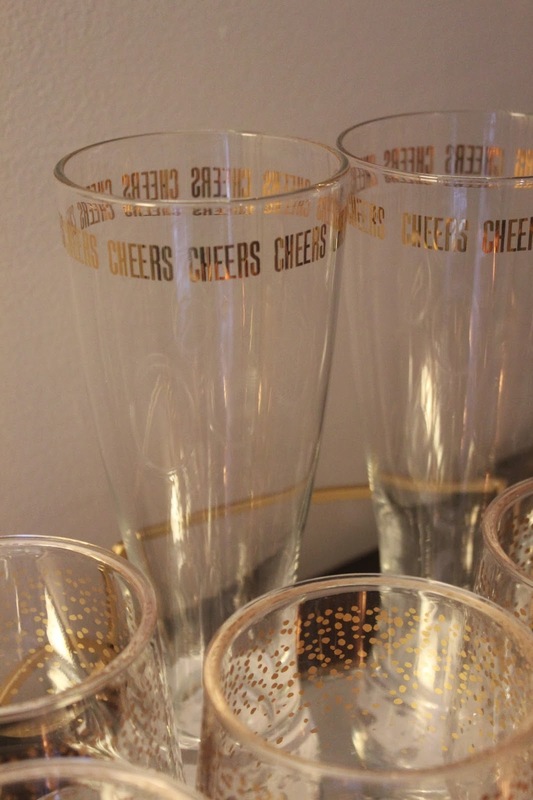 I freaked when I saw those "Cheers" glasses at Target, I love them. I without a doubt love your new bar! Hope you have enjoyed it thus far..